Going batty: What’s in a name? Last year I got what I thought was a strange request. The people on my project who have to deal with the public were finding it difficult to explain why they needed to sample soil mites on people’s land. They suggested that people might be more responsive if I would give the mites names. I replied that I had already given them names – the Latin binomials – and if they would ‘Speak the speech, I pray you, as I pronounc’d it to you’, they had all the names they needed. But no, it seems that scientific names come trippingly not, on the tongue, and make most landowners uncomfortable or downright suspicious. Of course part of that may be that I tend towards my own idiosyncratic pronunciations. I may confuse scientists whose first language is not English (e.g. Pinus always sounds like a pine-us from me), but they still seemed good enough for media and landowners. But no, they asked for common names, please, just like birds and plants and if I didn’t do it, they would coin their own. Synchthonius crenulatus - Fused-soil crenulate? 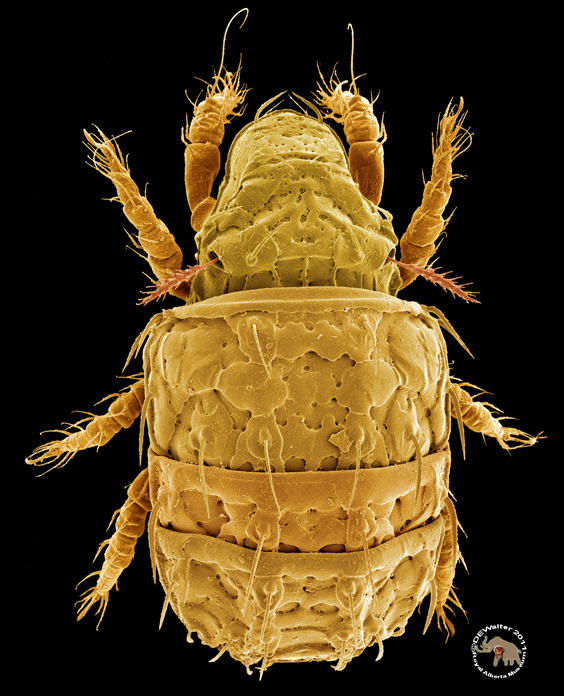 Well, I’m not one to make another’s job harder than it has to be, but unfortunately although there are common names for a few mites – mostly pests of one sort or the other – soil mites mostly go about their business with no one the wiser. So what to do? Well, since I work in a bureaucracy, first up was a protocol. Rule One was that, all else being equal, the common name should be based on the scientific name. 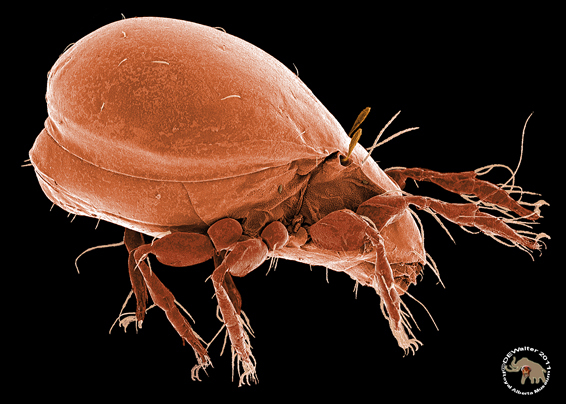 Rule Two, that inequality being rife, the name should be reasonably descriptive of the morphology, ecology, or behaviour of the mite. Hence our Pterochthonius angelus at the top became ‘Angel-winged Soil Mite’. I thought that was pretty good – and probably pretty much what Antonio Berlese was thinking when he made it the type species of his new genus in 1913 (before that it was in Cosmochthonius – so God knows what he was thinking then). But I quickly hit a snag as with the clunking and obscure Synchthonius van der Hammen, 1952. This probably refers to a fusion of some of the lateral platelets, but I’m just guessing here. Still, maybe ‘Crenulate Soil Mite’ will do. But then came the first real impasse. 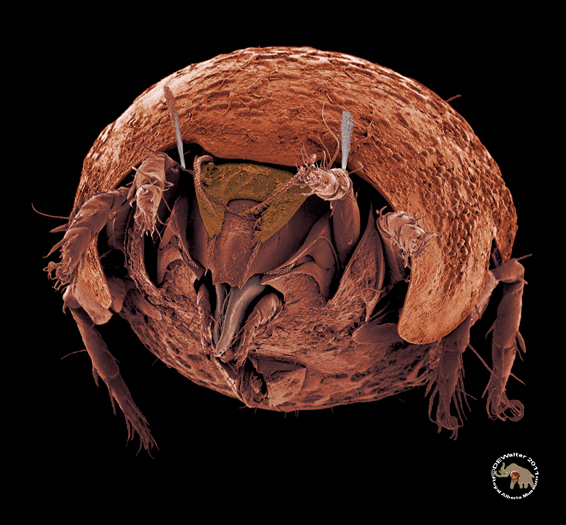 Behold Camisia biverrucata (CL Koch, 1839) – The Double-warted Nightgown Mite! Now that was fun and descriptive. When von Heyden proposed Camisia in 1826 my guess (I think I’ve become psychic) is that he was thinking the thick waxy coating of cerotegument was rather like a nightgown covering the mite. Camisia is Latin and old French for a shirt or nightgown from which Middle English derived ‘chemise’ (and later Romance languages gave us the shorter camisole), so von Heyden certainly may have been daydreaming of nighties. The two ‘warts’ on the bum are diagnostic. Everyone at the Museum had a good laugh at this one and then I sent it on. My colleagues in public relations, however, were not amused. They appealed to me: ‘imagine trying to explain a “warts and nightgown mite” to a landowner’! Bugger, just when this exercise in popular nomenclature was getting more fun than frustrating! Hence Rule Three: no names too icky, too easily misconstrued, or potentially rude. 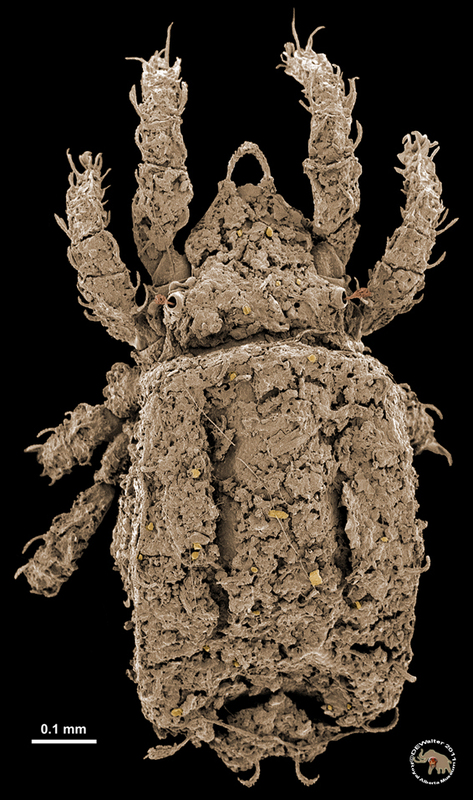 So, we now have the ‘Twin Butte Nightgown Mite’ (its centre of abundance is around the town of Twin Butte). Well I lost that battle, but not the war: there are at least 7 other species of Camissia in Alberta. Unfortunately, they tend to have names meaning ‘spiny’, ‘double-thorned’, and ‘horrid’. I’d better start thinking of descriptive euphemisms. But there are other problems to coming up with common names and the Oribatula above is a good example. The Suborder Oribatida has a lot of generic names with similar roots, from Oribata Latreille, 1806, an obsolete genus. For example, species of Oribatula, Zygoribatula, Tectoribates, and Oribatella are common and diverse in Alberta. No one is sure where the ‘oribat’ in Oribatida comes from, but one hypothesis is that it is from the Greek ‘oro’ referring to a mountain (as in ‘orogeny’) and ‘bat’ for ‘one who walks or haunts’. So, oribatid mites are ‘mountain roamers’? Well I guess it is possible. One could also translate ‘ori bata’ as the Latin for ‘mouth approval’, but that seems too weird even for an acarologist. ‘Bat’ can also mean a bramble in Greek and these mites do have a lot of spines, and ‘oro’ is Italian for gold, so maybe ‘thorny gold’ was the inspiration? I like that, but only because I just made it up out of the ether. So, with ‘Oribata’ unresolved, I’ve had to punt and went for ‘Roamer’: the probably undescribed species of Oribatula above is now officially the ‘Field Roamer’ – common in fields, croplands, and open grassy areas. Zygoribatula are ‘Yoked-Roamers’, Oribatella ‘Little Roamers’ and Tectoribates ‘Shelf Roamers’, but is there a better solution? Google tells me that there is a lizard in New Guinea named Emoia oribata Brown, 1953, and an Australian spider named Tegenaria oribata Simon 1916, and even music called Ori Bata (the Ori beat?). Maybe ‘Oribata’ does mean something logical? Perhaps someone out there in the ether can help and offer me a better translation? This entry was posted on February 10, 2012 at 5:16 pm and is filed under Oribatida. You can follow any responses to this entry through the RSS 2.0 feed. You can leave a response, or trackback from your own site. Great images again. 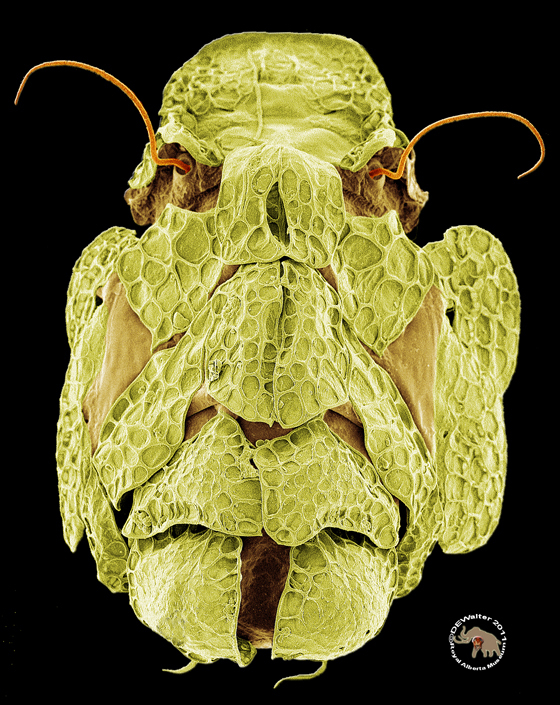 The P. angelus is particularly outstanding, and I first recognized it as the face of some archaic Orthopterid. And ‘Roamer’ for the oribata seems apt, kind of like ‘Strider’, except for those with short legs. 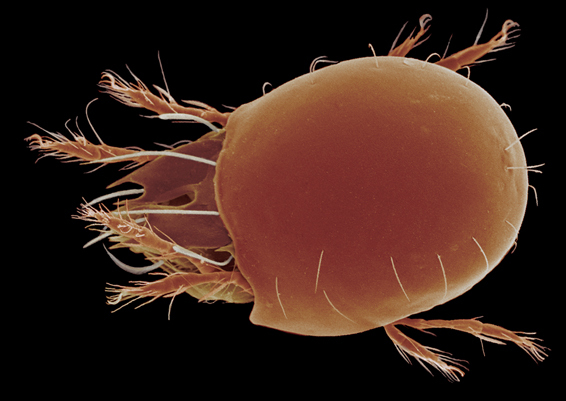 I have no clue as to the origin of ‘oribata’, but I remember when I first saw the word it came out as ‘orbitada’, which made sense because the water mites I was looking at were orb-like. Thanks – just learned how to edit replies and correct the italics. One thing I like about Google+ is being able to edit one’s comments. Yesterday I had a bad spelling day, especially with Camisia and Roamer. Let me know if you see any other errors. Gotta keep the constituents happy — a chicken in every pot and a common name for every mite. Just finished a communication course. Cannot emphasize enough the importance of what you are doing in terms of getting funding via public interest and support. Favourite was Alaskan Darkeye. If it could be a fish common name (which that one could), it’s a good sign. Late to the game, but I can’t think of a better way to communicate to laymen what you’re looking for in the field than to show them one of your pictures of the bug. Print up a ‘wanted’ poster with the mite on it and use that to show what you’re after. Even later to the game, but I do a good bit of Latin/Greek editing and etymologizing for my anty colleagues, so maybe these comments will help . . .
— I note you have two different spellings for the nightgown mite genus Camisia & Camissia. Which is right? — I would suggest that a better translation for Tectoribates would be either thatch roamer or roof roamer (roofs having once been mostly made of thatch). Thanks James, I thought I’d caught all the deviant Camisia. ‘Tectum’ for a shelf-like plate of the cuticle (usually for the legs to be tucked under to protect them from ants and other nasties) is well established in mitespeak, but you are right on the origin being roof or roofer in both Latin and Greek. Quite a few oribatid mites are arboreal and I would imagine thatched roofs have significant populations of them. Unfortunately, Tectoribates all seem to be soil-dwellers. However, they do have large, roof-like lamellae (a type of tectum which, confusingly, seems to be derived from the Latin for ‘small plate’). Still, I think I like Roofed-roamers. I guess I should work up an image.